Kim Jong-Nam murder suspects visit airport crime scene. Sepang (Malaysia) - Two women on trial for murdering the North Korean leader's half-brother visited the Malaysian airport on Tuesday where they allegedly poisoned him, escorted by huge numbers of heavily armed police. Indonesian Siti Aisyah and Vietnamese Doan Thi Huong, wearing bulletproof vests, were brought to Kuala Lumpur International Airport's budget terminal along with the judge in the case, defence lawyers and prosecutors. About 200 police, many armed with rifles and wearing masks, fanned out as the entourage arrived at the terminal. After being escorted round the airport pursued by a huge pack of journalists, the suspects appeared to get tired and were placed in wheelchairs. Huong and Aisyah, in their 20s, are accused of killing Kim on February 13 by rubbing the nerve agent VX on his face in a Cold War-style hit that stunned the world. The women, who were arrested a few days after the assassination and face death by hanging if convicted, have pleaded not guilty to murdering the estranged half-brother of Kim Jong-Un. At the airport, the women were first taken to the check-in area where they allegedly smeared the deadly nerve agent in Kim's face. He died an agonising death within 20 minutes of the attack with a chemical so deadly it is classified as a weapon of mass destruction. The suspects were then taken to a cafe called Bibik Heritage, where Aisyah met a man identified in court as "Mr Chang" who allegedly wiped a liquid on her hands before she carried out the attack. The group headed to the clinic where Kim was taken after the attack and then to a taxi stand, where the women went after the alleged murder. The women are accused on the charge sheet of committing the murder with four other suspects, who are still at large. Four North Koreans fled Malaysia on the day of the murder. The assassination sparked a fierce row between Malaysia and North Korea, which is suspected of ordering the hit. Pyongyang denies the allegation. Two women on trial for murdering the North Korean leader's half-brother visited the Malaysian airport on Tuesday where they allegedly poisoned him, escorted by huge numbers of heavily armed police. 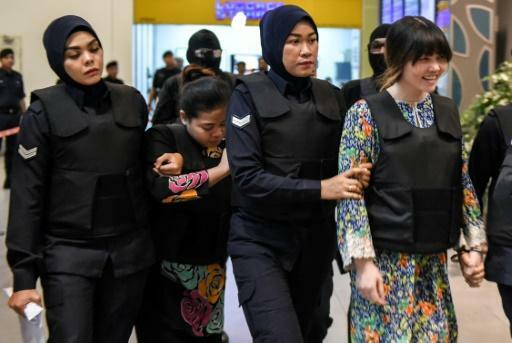 Indonesian Siti Aisyah and Vietnamese Doan Thi Huong, wearing bulletproof vests, were brought to Kuala Lumpur International Airport's budget terminal along with the judge in the case, defence lawyers and prosecutors.